I once shot a nine-millimeter pistol at the Los Angeles Gun Club. The sensation was one of immense power, one in which thoughts that would normally unthinkable, or at least separated from the realm of immediate possibility, are brought to bear. The pistol was a surprisingly simple device, the power of which could easily be turned from the sketch of a burly, disagreeable man hung a few feet in front of me to any animate thing in the room. Its historical power was palpable, and fascinating. But in the time since I have felt little desire to fire one again and thought about them little. I find myself thinking about guns in this forum because they are a singular commodity in Neal Stephenson’s newest novel, Reamde. The novel flaunts the same wildly far-reaching intelligence and set of interests that unified ancient linguistics and futuristic pizza delivery in the sci-fi landmark Snow Crash, or that brought together the World War II origins of computing and a sort of proto-Bitcoin in the under-appreciated Cryptonomicon. A new set of puzzle pieces has been assembled, more contemporaneous and straightforwardly geeky than his previous works: Islamic terrorists, Chinese gold farmers, Russian syndicates, Renn-faire biker gangs riding around with claymores, and a fantasy MMORPG complete with a painstaking realistic precious metal based economy. But, above all else, the author’s powerful attentions seem to have been enraptured by the cold charm of the firearm. Like an episode of Curb your Enthusiasm spread over nearly 1000 pages, the aforementioned plot points (and about a dozen more) are brought face-to-face all around the globe. Stephenson’s descriptions of the Chinese port city of Xiamen and of libertarian survivalists in northern Idaho are measured, written with the air of careful study that befits the hard science tradition. It is a language of even keel, of encyclopedic detail and plentiful allusion that displays an intensity of authorial research that will reward any reader curious enough about the the world to do the same. But where a writer like Thomas Pynchon can go into a massive tangent on, say, secretive European postal dynasties and still synthesize a driving and meaningful narrative, Reamde devolves into a staggeringly long shoot-out. At his best, Stephenson is more than capable of the same integrative, driving fiction; without a doubt, his work is worthy of the same broad appeal as Pynchon, and may be more popular. With such rich grounds as the international relations of World of Warcraft, there is no reason why it could not have been accomplished again. Instead, the book finds itself reveling in gun violence, a preoccupation not only with the the typical drama of cover fire and heads exploding under a sniper’s hail, but also with the geeky details—hammers, safeties, gauges, and even idiosyncrasies of certain models of pistol. It is unflinching, unquestioning, and ultimately not very much fun. Cory Doctorow, reviewing the book at Boing Boing, felt himself caught up in the “verve…itching to find a gun range;” I felt sincerely bored. When the rollicking war fictionalization of Cryptonomicon grows to be tedious, the narrative jumps to the travails of a socially awkward mathematician stuck in rural England; here we are relieved from the action of Russian folks shooting at Uighur folks in China by a bit of South Indian Islamists shooting at Canadian folks in British Columbia. Such is the downfall of the novel’s potential. Stephenson’s language, his cool measurements of the globe in 2011, are without error. Exemplary is his loving derivation of the essential spirit of the American Mid-West from its extreme politeness and its Frito Pie as a “compound food” diametrically opposed to California cuisine. 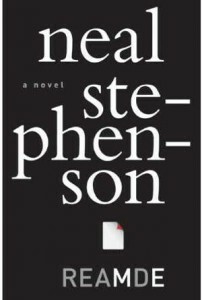 His references to youth’s symbiosis with “googlemaps” and the like are delivered without the patronization and pomposity of so many others of his generation, and they encapsulate the best that he has to offer: a popular fiction written by the phenomenally intelligent and technologically versed. It is to be chalked up to our misfortune that his gifts have been misspent on an only somewhat thrilling global gunfight and not something of far greater speculative and imaginative scope.